Seemingly discontent with the progress made towards peace on the Korean peninsula, John Bolton, Donald Trump’s new national security adviser, asserted that the United States is currently using the “Libya model” in guiding the denuclearization of North Korea – a model that eventually led to the destruction of the North African country and the overthrow of its government in 2011. The statement seemed intended to provoke tension during the ongoing Korean peace summit, where leaders from North and South Korea have agreed to work towards a peace treaty that would formally end the Korean war after 65 years and lead to the denuclearization of North Korea under international supervision by the end of the year. Bolton’s mention of Libya is provocative as it alludes to Libya’s nuclear disarmament at the behest of the U.S., which was strongly criticized by the North Korean government at the time and subsequently cited as a major reason for its decision to not denuclearize sooner. Appearing on Face the Nation, Bolton told host Margaret Brennan that “I think we’re looking at the Libya model of 2003, 2004,” in regard to the denuclearization of North Korea. He made similar comments on Fox News Sunday. We’re also looking at what North Korea itself has committed to previously and most importantly, I think, going back over a quarter of a century to the 1992 joint North-South denuclearization agreement where North Korea committed to give up nuclear weapons and committed to give up uranium enrichment and plutonium reprocessing. Ironically, Bolton was instrumental in sabotaging North Korea’s previous commitments to denuclearization while he served in the George W. Bush administration. Bolton’s mention of Libya drew immediate concern, including from mainstream media outlets. What it means for the North Koreans, they know what the eventual outcome of the Libyan model was, which is Gaddafi gave up the ability to put together nuclear and chemical weapons and he ended up dead. Gaddafi caved soon after and, in 2003 — prior to the invasion of Iraq — he contacted the U.S., U.K. and Russia and agreed to abandon Libya’s nuclear program and the development of other weapons of mass destruction in exchange for an end to Western hostility towards the nation and promises of foreign aid. 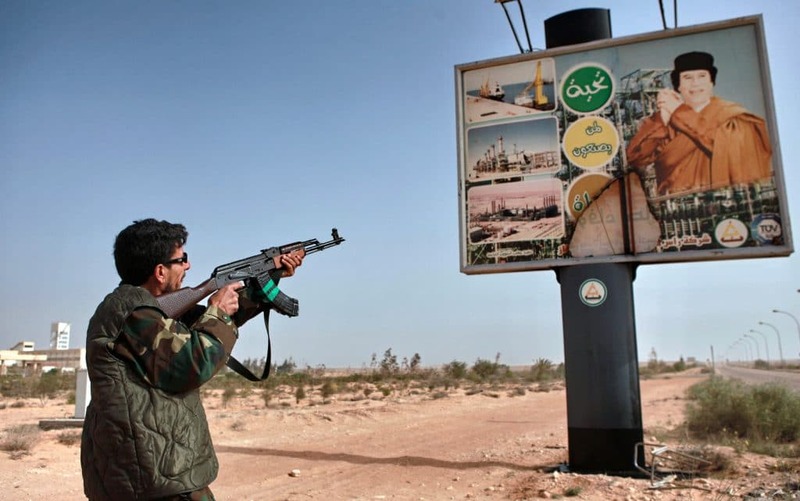 Gaddafi’s willingness to abandon the program led to secret talks that resulted in Libya’s public announcement of its disarmament plans some nine months later in December of that year. However, in negotiating disarmament, Gaddafi did not get security concessions for Libya in exchange for his disarmament, a mistake that would later prove fatal. Around eight years later, amid Gaddafi’s bid to challenge the U.S. petrodollar system with a gold-backed pan-African currency, Western-manufactured unrest in the country led the Libyan government to suppress the increasingly violent protests, which soon led to outrage in the West that Gaddafi was “slaughtering his own people.” The U.S. and NATO subsequently conducted a bombing campaign to help Libyan “moderate rebels” overthrow the government. Gaddafi was captured by one of the rebel groups, who sodomized him with a bayonet and killed him. Seven years after the overthrow of its government, the country now finds itself well into the final stage of the “Libya model.” Once the country with the highest standard of living in Africa, Libya is now home to a booming slavery market, a growing illegal arms trade and several terrorist groups. The country is now a textbook example of a failed state and – more importantly from North Korea’s perspective — a testament to what the U.S. government does to countries who threaten its agenda or superpower status, especially after they disarm or denuclearize. As a North Korean official noted at the time, “The Libyan crisis is teaching the international community a grave lesson,” namely that U.S.-brokered attempts at nuclear disarmament are ultimately “an invasion tactic to disarm” countries. Will Bolton risk denobelizing Trump? Given the well-known outcome of the “Libya model” and the likely impact such comments would have on the North Korean approach to current peace talks, the question then becomes – did Bolton make the comment with the purpose of undermining a peaceful resolution to hostilities on the Korean peninsula? Though the weeks ahead will likely provide evidence as to whether this is true, Bolton’s previous comments and actions in regard to North Korea suggest that he hardly favors peace. Indeed, in recent years, Bolton has repeatedly argued that “regime change” was the only “diplomatic” solution left that could be used to denuclearize the Korean peninsula. In addition, Bolton has also helped sabotage past agreements aimed at denuclearizing North Korea. While serving as Undersecretary of State for Arms Control and International Security under George W. Bush, Bolton helped convince Bush to end the 1994 Agreed Framework between the U.S. and North Korea that sought to freeze and replace the latter’s nuclear power program with non-nuclear alternatives. Bolton accomplished this by misrepresenting the terms of the agreement in order to suggest that North Korea was no longer in compliance, and by distorting intelligence so it could be used as his “hammer . 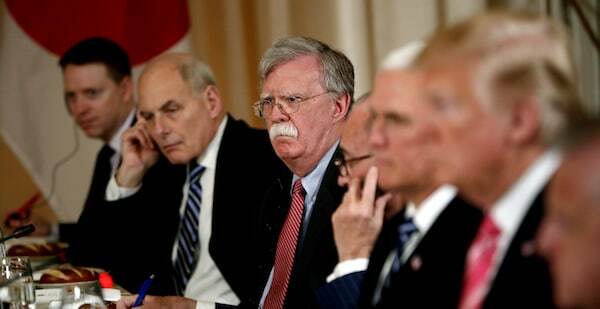 . . to shatter the Agreed Framework.” That precedent and Bolton’s more recent rhetoric on North Korea suggests that sabotaging diplomacy in order to pave the way for a military solution is very much within the realm of possibility. Attempts to sabotage the Korea peace talks may also find support from elements within the U.S. government and military. Indeed, were peace achieved, there would be little reason to maintain the 15 U.S. military bases in South Korea, along with the approximately 28,000 American troops currently stationed there. The removal of those troops would drastically reduce U.S. presence in the region, something the U.S. has sought to avoid in order to more effectively counter China’s growing influence. In addition, other powerful forces in the U.S. are wary of peace on the Korean peninsula — namely, U.S. weapon manufacturers. Without the threat of a hostile, nuclear-armed North Korea, sales of U.S. weapons and missile defense systems to South Korea – as well as nearby Japan –would substantially decrease, threatening the bottom line of mega-corporations, many of which have a close relationship with the Trump administration. Despite the forces from the U.S. eager to see peace talks fail, the success of the peace talks on the Korean peninsula will ultimately come down to the resolve of North Korean leader Kim Jong-un to resist succumbing to provocations and the resolve of South Korean president Moon Jae-in, who has made it clear that he will resist any outside attempts to influence the outcome of the peace talks and to undermine South Korean sovereignty. The Trump administration has already made attempts to “strong arm” South Korea in order to influence the talks, to no avail. For the sake of peace on the Korean peninsula, let’s hope Moon and Kim hold onto their resolve – and Bolton holds his tongue.